No it is fabulous. You are totally right. I find that the more obvious choices of blue and white striped shirts and red accessories become to much of a typical and obvious french-statement look, despite the fact that I love those looks and am wearing one similar to that on my blog, oh my. This is so much more understated and subtle, which I love. I think it looks fabulous - it has odes to being Parisian, but it's totally your look - if that makes sense :) Really love it! oh man. those boots are cu-ute. just when i think i have every boot i could possibly need. thanks, steve madden. love the skirt! so cute with the boots! Ah, this has inspired me! I love it. Great outfit! You look stunning. I love how you coordinate everything so cheap and looks fabulous!! Oh yes, you look totally Parisian-chic. 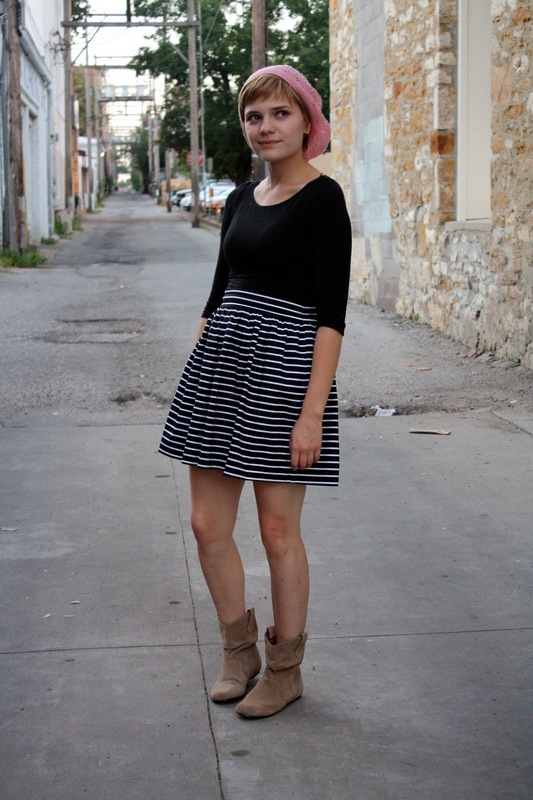 Perfect combo, especially with the little pink beret!